Who Has The Most To Prove In The Chase? For some just getting into the dance is enough. Resetting the standings may offer an opportunity for outsiders AJ Allmendinger and Aric Almirola a chance to bust loose in the middle of the floor, but for these teams, just getting there is a big deal. Other drivers like Greg Biffle, Kasey Kahne, and Carl Edwards are the NASCAR equivalent of the Houston Rockets: good enough to get in, just not enough to mount a serious challenge. Among the field are drivers in their first year with new teams: Ryan Newman, Kurt Busch and Kevin Harvick. Accomplishing what Harvick has is particularly impressive. Jimmie Johnson and Jeff Gordon have made statements with their careers. Teammate Dale Earnhardt Jr. has with his best season in a decade. Brad Keselowski has already proven he is not a one hit wonder; Penske teammate Joey Logano that he is not a bust. That leaves three drivers from one organization not yet named. There once was a time you could argue that Joe Gibbs Racing was the best team not named Hendrick Motorsports. Between Matt Kenseth (2013 Chase runner-up,) Kyle Busch and Denny Hamlin, JGR won 12 races last season. This year, the power trio has a combined total of two. It would be difficult to argue that Penske hasn’t passed up Gibbs, and there are plenty of days Stewart-Haas Racing has looked better than JGR. Gibbs’ supporters can argue that the continual tweaking of the series by the powers that be have affected them, but let’s not forget everyone races by the same set of rules. 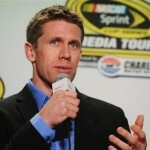 JGR has been beset with technical issues, rules infractions and a little in-house bickering. Busch, Hamlin and Kenseth come stumbling into the Chase with finishes of 14th, 21st and 41st at Richmond. 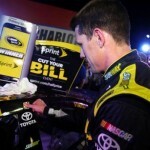 In their last five races, Kenseth has an average finish of 18.6, Hamlin has a 19.0. Kyle Busch has an anemic average of finish 29.0. Yuck! That brings to bear a discussion of a key player at Joe Gibbs: Kyle Busch. Want a driver with a lot to prove? Here he is. 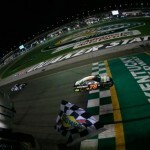 Quick- no peeking; what is Kyle Busch’s best season finish in the NASCAR Sprint Cup Series? He’s never won the Chase. 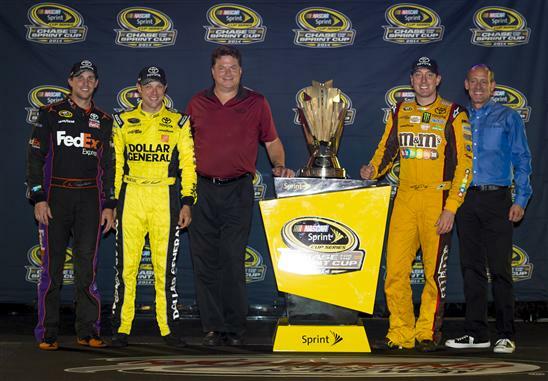 Busch hasn’t even been a runner-up, something Kenseth and Hamlin have both recently accomplished. He hasn’t even finished third at season’s end! The best finish Kyle Busch has achieved in the Cup Series is FOURTH! Remember when Busch won eight races in his maiden voyage for JGR in 2008? He collapsed in the Chase and finished 10th. He didn’t even make the Chase in 2009, and then followed that with finishes of 8th, 12th, and 13th, before last season’s fourth place run. It’s like Kyle Busch is the Dwight Howard of NASCAR. The talent is undeniably there, but in terms of grabbing the brass ring, it hasn’t happened. It has to be a bitter pill to swallow for those fans of the 18 that so taunted Earnhardt fans in days of recent yore. In fact Busch himself made statements after a win at Bristol that NASCAR’s most popular driver was more interested in selling tee shirts, while he was focused on winning. I’ve never heard a Junior fan tell me he was the greatest driver in NASCAR. They rooted for him for a number of other reasons. I have heard more than one fan tell me they thought Busch was the greatest driver in NASCAR. You can root for for whatever reason you want, I’m just not buying the greatest driver label……yet.